It was about time I bought a Big Happy Planner. I had a classic that I tried out last year and used as a fitness planner. Then I purchased a Mini which I used for work for a short time. I’d been asked by customers a few times if I was planning to create Big HP sticker kits and when I saw one on sale I decided to snap one up at last. I ordered an 18 month one and when the box arrived, it was super heavy, It was also so big it arrived in a pizza box. This thing is huge! It’s by far the biggest planner I’ve ever owned. The cover on this planner is laminated and similar to that on the Mini. I’m not a huge fan of a lot of the cover designs, but I liked the chevron cover on here. Sadly, there were some fine scratches on this cover. I don’t think this was down to the delivery as I’ve heard quite a few stories of imperfect HP covers. It’s barely noticeable though, so I didn’t mind too much. On opening, the planner has only a couple of pages at the front. The usual page for your name and a 2017 and 2018 calendar at a glance. I don’t see the point of these at a glance calendars, and have never used them. Also like the Mini, each monthly divider has a tab to allow for easy page finding. Some of the tabs are also foiled, which is a nice touch. There’s also some foiling detail on some of the monthly divider pages. Although they do tend to have cutesy/inspiring quotes that make my cynical eyes roll. At the start of each month there’s also a monthly summary page. Here you can write what you’re up to, what’s going on and any goals you have. I feel this page is a little unnecessary and would prefer just a notes page. The dates and birthdays go on your monthly planner so I don’t see why I need it in a second place. Onto the monthly pages and there’s so much space here. In fact, there’s so much that down the left hand side you can easily fit your monthly goals without having it on that previous page. I do like to have my month at a glance all in one place, and this monthly layout gives me that. Each month has a colour theme that goes through everything from the divider to the weekly pages. While this is a nice touch it goes a bit far on the weeklies. Each weekly spread has a colour dotted band that runs down the middle. This is impossible to cover up without a proper punch so you either have to match your theme to it or just ignore it. I’ve gone for the ignore approach as sometimes the colours don’t match the month too well. October for instance, which you would think of oranges and rusts for, is actually purple. The layout of this is fantastic though and you have bags of room. There’s a side bar for weekly to do’s and notes which is handy for habit trackers. The width of this is narrower than the daily boxes so it takes stickers sized for the Erin Condren perfectly. In terms of those daily boxes, they’re massive. They’re wider and taller than Erin Condren boxes so you’ll struggle to use any EC sized kits. The header/title boxes though are a lot slimmer. This makes it a little odd for sticker making. To make stickers exactly that size would just be too skinny and the font too small. If you’re using a kit you’d obviously want to cover them up, unless your kit matches the colour. I love how big these boxes are though. There’s more than enough space for any to do lists, pretty stickers or even Polaroid Snap pictures. That is a selling point of this planner and would be ideal for anyone that uses a planner for memory keeping instead of a traditional scrapbook. I personally use a scrapbook but it’s a nice idea to have a planner perfectly sized for Snap prints. One last thing to note on the weekly pages is the quote/saying on the bottom of the right hand page. These are on every other page and I feel the same way about them as I do the saying on the divider pages. A bit cringe. So far I’ve tried a couple of different ways of planning with this and I’m loving it. The first week I made a kit to fill the bottom boxes with full stickers. The top box was for the day’s events, and the middle was for tasks and to do’s. I liked having it segregated that way. It looked nice and organised. The week that I didn’t use a kit it was a little more disorganised. I just kind of put anything anywhere. It gave me more sticker space and actually turned out quite pretty. Next I think I’ll try a layout where I give one box to home, one to the shop and one to blogging related things. After using this planner I’ve struggled to go back to personal. I tried this out for a couple of weeks and then went back to my 2017 planner, my Filofax Burnt Orange. Unfortunately I finished planning the week and realised it just wasn’t working for me. There was nowhere near enough space. Previously I was planning home in this and work in my Midori. I didn’t want to go back to two planners though. Having everything in one place, sat open on my desk was working perfectly. So I basically went back and replanned the week in the Big Happy Planner. Now for stickers. Because this is so huge none of my kits will really work. Functional or quarter box stickers do, but full boxes and headers are a no. There’s also not a lot of Etsy shops out there selling Big HP kits it seems. I’m now making kits but there’s only so many I churn out. I also have a backlog of smaller sticker kits I’m worried I now won’t use. So while I do love this planner, I’m probably going to pick up another Classic Happy Planner. It’ll be interesting to see if I miss the extra space. It may be that once I’ve gone through my sticker backlog that I go back to this. I’m really happy with this planner. They could lay off the inspirational quotes but I know a lot of people will like them. The space and functionality you get with this planner is the best I’ve seen. However, there doesn’t seem to be as wide a range of add on packs like the classic. While you can punch your own pages and put them in this planner, the paper isn’t A4. It looks to be American letter size (wider but shorter than A4). Given some people choose the HP over an EC because you can put in new pages easily, this may put people off the bigger size. Like the other Happy Planners I’ve used the paper is extremely high quality. It’s lovely and thick with absolutely no bleed or ghosting. This alone is enough for me to choose a Happy Planner over an Erin Condren. There’s only one thing missing from this planner. And it’s a really minor thing, but I’m missing a page marker. I’m using a small paper clip at the moment but the lack of page marker really annoys me. To get round this I have just been leaving this open and folded over on my desk most of the week. I’m more productive that way anyway. Finally, as I now own all three sizes, here’s a comparison of them all. 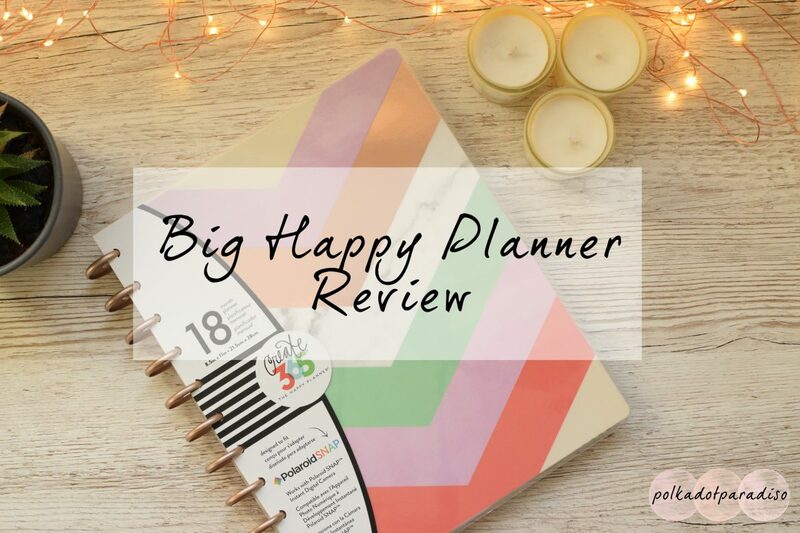 Do you use a Happy Planner? Let me know which size in the comments below!